I have medical payments coverage under my car insurance policy. What is that for? Should I give the car insurance company a recorded statement after a car accident? If you call a car insurance company after a car accident, you will talk to an insurance adjuster whose job is to reduce the value of your claim or deny it entirely. This is true whether it is the other person’s insurance company or even your own insurance company. Car insurance companies are in the business of making you pay as much as possible while they pay out as little as possible. 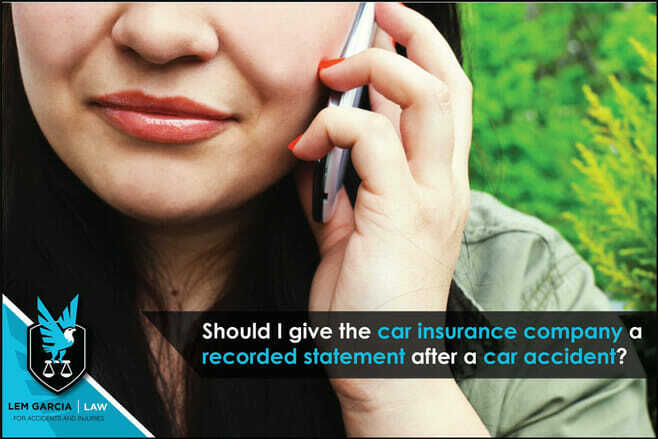 With that in mind, it is important that you do not provide the car insurance company with a recorded statement. When you call them, they will ask you a few details about your case and then they might ask you if it is OK if they record your conversation. You are under no legal obligation to provide them with a recorded statement. It is also illegal for them to record you without your permission. If you decide to talk to the insurance company before calling a personal injury attorney, make sure that you do not provide a recorded statement under any circumstance. The insurance company is recording you because they are thinking about the big picture. They want to hurt your case as much as possible now so they have to pay out as little as possible later. For example, even though you were just involved in a car accident minutes prior, they will ask you if you were injured. It is well-known and well-accepted that people who have been involved in a car accident often feel the effects of the crash hours or even days later. Unfortunately, the insurance company wants to get it on record as soon as possible that you are feeling OK, even though the truth of the matter is that it is too early to tell. Don’t feel pressured to provide a statement and don’t get coaxed into providing a statement. Some insurance adjusters make it sound like you are obligated to provide a recorded statement even though you are not. Some insurance adjusters make it sound like they are your best friend and that they would not want to do anything to hurt you. Don’t trust them. No matter what technique the insurance adjuster uses, the adjuster wants to take your recorded statement because they are trying to hurt your case so they have to pay out as little as possible, or nothing at all. If you need a car accident attorney in West Covina, because you were asked to give a recorded statement, call Lem Garcia. Lem Garcia Law will help you protect your rights and help you recover as much as possible.